Flooded Basements Parma , basement waterproofing is very important for your home’s longevity. Foundation water problems can arise with the snowy winters and heavy rains in the spring. Wet basements and crawlspaces are the leading cause of indoor air quality problems. Mold, mildew, and radon can penetrate into your home and cause severe health issues. Not only are we experienced and highly trained in all the services we provide, but we also stand behind our work. We take pride in completing a job the RIGHTWAY. You can be assured that our company will explain all of our options and provide quality workmanship backed by our professional customer service team and competitive prices. Our company is certified in mold remediation and basement waterproofing. We’ll work with you to make sure you get the service you need, by assessing the problem and making an honest and accurate recommendation. The most effective of the interior drainage system is a perforated drain pipe installed inside the perimeter of the footing. This requires removing and replacing concrete at the slab edge. By placing the drain pipe beneath the slab, it drains the area to a lower level and ultimately to a sump pump. The pump should have an airtight, childproof cover. A critical component of this method is the dimpled plastic sheeting (mira-drain), placed at the base of the wall and beneath the slab edge. Mira-drain is similar to a small egg crate and permits free drainage of the wall into the drain pipe. It is less expensive than many specialized drainage channel systems. Once the floor is cut 12” from the footing of the home, cement and debris are removed and a channel is dug. The channel is then cleaned and the proper slope is installed. Then each cell of cinderblock is drilled, removing all water which has accumulated within the foundation walls. Once the blocks are drilled, water no longer builds up in them and will flow freely through the holes into the drain system. The sump pump discharges outside of the foundation wall, according to local codes. 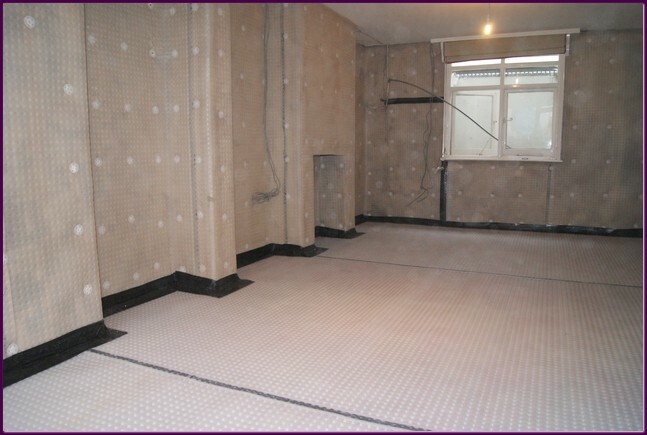 The floor is resealed with concrete and all debris is removed by our basement waterproofing company. That’s when the problems begin! Water begins pushing against the foundation of your house and up through the floor, causing hydrostatic pressure. This constant pressure will eventually lead to water seepage, cracked walls and/or floors, deteriorating foundation, and settling of homes (where the house actually sinks into the ground). Waterproofing is actually a loosely used term, because it’s impossible to totally “waterproof” a home. The key to keeping your home dry and sound is water management. Flooded Basements Parma has over 25 years of experience in managing water as a basement waterproofing company. The process of water management is simple: collect the water before it has a chance to even touch the foundation of your home. This is done with a sub-floor pressure relief system. The goal is to allow the water to naturally go on its path into a drainage system, and have the drainage system pump the water away from your home with the use of a sump pump. Flooded Basements Parma specializes in many different types of water management systems. Depending on whether the water is mostly on the floor or the walls, and what type of foundation you have, our highly trained field inspectors will determine the best, most economical method of keeping your basement dry for the life of your home! Hours of Operation are 24 Hours A Day!